Join us in celebrating Veterans every day by sharing a story about a Veteran who has touched your life. Share a story you have about a Veteran in your life. Your story can help inspire others to honor and care for America’s Veterans. We’ll showcase selected submissions online and share them with the others in our community. 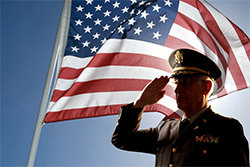 Thank you for saluting your Veteran with us.